Lets get things straight first...if you are going into the Tourist thinking it is going to be a wild ride like a Jason Bourne film, then you will be sorely disappointed. 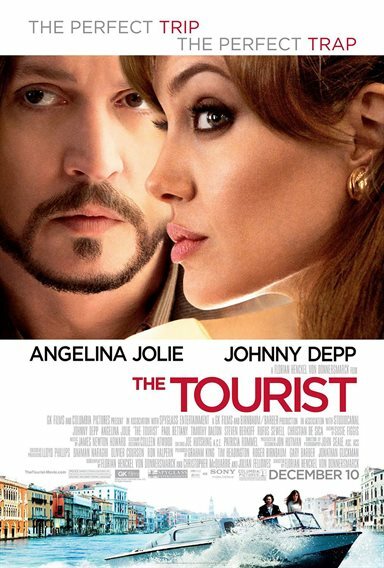 The Tourist, directed and written by Florian Henckel von Donnersmarck, tells the story of Frank Taylor (Johnny Depp), an American tourist, who crosses paths with a stranger woman, Elise Ward (Angelina Jolie). She is trying to evade Interpol and meet with her former lover, Alexander Pearce, in Venice. While the premise sounds something out of a spy novel or reminiscent of Hitchcock's master piece, North By Northwest, that is where the similarities stop. The plot never delves deeper into the mysterious it might unfold, and the creative team behind the film choose to simply give us a stagnate half-thought-out adventure story through its run time minutes. Even while the Hollywood powerhouses of Jolie and Depp try to give their best to the film, it appears that they are just going through the motions themselves trying to make sense as to what is going on around them. Their characters apppear not to share any chemistry, and it is not believable that they are drawn to each other. Throughout most of the film, Jolie appears to be channeling her inner Laura Croft wooden performance, and Depp seems to be doing an Americanized Captain Jack Sparrow. On a positive note, the film looks beautiful. Director of Photography, John Seale, captures Venice in all it's beauty. The water channels look breath taking, and the city itself becomes alive right before ones very own eyes. The Tourist truly has a great plot set-up, a great set up of leading characters, and so much potential to become an amazing iconic film; but alas at the end of it all, The Tourist ends up falling flat on it's face. Download The Tourist from the iTunes Store in Digial HD. For more information about The Tourist visit the FlickDirect Movie Database.